A big article in my local newspaper yesterday proclaimed the benefits and joys of running barefoot. It seems new studies are coming out showing that countries in which runners go barefoot, or wear shoes with minimal support, have far fewer foot problems and are much swifter. A podiatrist was interviewed for the article because he’s a big believer in barefoot running, and he said that the human foot is an architectural marvel. 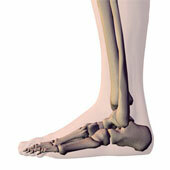 The arch is incredibly strong, with an astounding support system of muscle, bone, joints, tendons and ligaments. But when we bolster up the foot with all kinds of support, we actually weaken not only the arch, but the entire foot and ankle. In other words, we have shoe-dependent feet, which is not how nature intended us to be. We were made to be shoeless. I don’t know about you, but I’m going WHOO-HOOO! YES!! You see, I have a dirty secret. Okay, make that dirty feet. I am a barefooter. I go barefoot all day when I’m at home. And since I work out of my home office, I’m at home a lot. I wear socks on only the coldest winter days. When people come to my house, they usually look dismayed, as though they don’t know what to make of me and fear that they, too, will be required to take off their shoes and socks. (They’re not). I know people who put on shoes as soon as they wake up in the morning and don’t take them off until they climb into bed at night. My feet get claustrophobic just thinking about it. I do put on shoes at home for dressy occasions, lest you think I’m a complete social misfit. But if I’m writing, or if I stroll out to my mailbox at the curb, or pull some weeds, I do it barefoot. It makes me feel like a kid again, completely in touch with nature. And now that my bunion is all gone, and my foot is strong again, I don’t have to be ashamed of the oogly foot. I guess you could say I have the world at my feet -- or at least under them. Would you be brave enough to venture outdoors in your bare feet? Would you run barefooted? Are you a morning-to-night shoe person, a barefooter, or somewhere in between? I am a child therapist and when I work with parents on teaching their children to walk, I always suggest barefooted because it's natural. There are several studies and barefoot really is the best. I go barefoot all the time, but I don't think I would run b/c today is different than yesterday and there's a ton more litter/glass that can cut your feet. As soon as I get home and know I don't have to leave again, off come my shoes. I go barefooted around the house all the time. Never thought much about going out in public barefooted. I try to go barefoot as much as possible. And while I used to always be barefoot in the house now I have to wear something, comfy flip flops are best, because I can' take the hardness of concrete floors, kills the feet and legs. Outside you never know when you will accidently find an ant mound and be biten, so have to wear something outside too. So gues I am an in between. I'd go barefoot more if my floors weren't so, um, disgusting. Oh, that's my fault. Right. And there's some nasty stuff on public sidewalks, like broken glass. Maybe if we all still lived out in the country it could work. I wear shoes outdoors, but once I'm in my house, the shoes comes off. Considering the fact that I live in Brooklyn with it miles and miles of dirty concrete, I'll stick to sandles in the summer and bare foot in the house. Our streets are too dangerous to walk with bare feet. Oh Kate, I was so impressed that you remembered my mom's notorious bunions from our childhood years. As you mused, "the things we remember as kids.." Oh yeah! I used to go barefoot outside when I was a kid. Now, the thought of all the dirt, broken glass, etc., that I might walk on make me reluctant to do that. I'll always make an exception to go barefoot on a sandy beach. Used to always be barefoot at home - got more than one bee sting from running outside barefooted. But working in libraries with concrete floors combined with aging brought on plantar fascitis, so here in AZ with an almost all tile house I have to wear something on my feet. I'm a barefooter as well. Only where shoes and socks when I have to. I'm often outside in my barefeet. When I do wear shoes I like them flat or a nice comfy tennis shoe. I think that it is wonderful that this study has found that being barefoot is better for us. Same for horses, horses do better when they go shoeless, shoes alter the natural form of the hoof. I imagine that shoes also alter the natural for of our foot as well and after years of wearing heel's for work I can say my feet feel better now that I stay barefoot most of the time, than they ever felt when I wore hell's all day. Dirty sidewalks, streets, and parking lots are yucky enough that everyone should wear some kind of foot protection. But if you ever have a chance to walk across a nice soft grassy lawn (barring unforeseen ant hills, of course) it's truly a delightful experience. You "feel" through your feet sensations that you just can't get any other way. With that said, I would not go about in any public setting without at least flip flops, just for the sanitary aspect. Another benefit from going shoeless at home -- clean carpets! I had to break my hubby of the habit of wearing his shoes upstairs to our bedroom. The stairway got black where he stepped. Ick! Now the rug stays clean. I feel better about walking around barefoot and he doesn't have to pay for carpet cleaning. It's a win-win. Candace, you doll. A feminine princess with bare feet. LOL! You are so bad, girlfriend. Sheila, put on fuzzy socks and dust those floors the easy way. I'm a barefooter. In the summer, at school, I kick my sandals off as soon as I get here because I am virtually alone. In the winter I wear thick socks if it's cold, but I have no problem in my yard without my shoes. I always walk around my apartment in socks/slippers, but wear shoes anywhere else, especially around my apt building (both basement and outside) - too many negligent dog owners who don't pick up after their pets. Yuck! I can't walk around barefoot in grass, either, as my feet have always been a magnate for burrs. They can be a mile away and find their way to my feet. Some type of shoe/sandle outside, barefoot inside. Even if my feet are freezing I have a hard time even wearing socks inside because my feet will swell up from the constriction. Weird! I wear socks in the house - sometimes with slippers. Outside it is shoes for me. I have awful feet (high arches) and I am usually cold so I wear socks or slippers inside. I always heard going barefoot was bad for your skin!! I love going barefoot! And my poor heels show that because unless I use my ped-egg and moisturize them every night, they get all cracked and tough. I have to wear shoes to work but often kick them off at my desk. I gave up hose years ago and only wear socks when it is freezing or below outside. On the days I work from home it is wonderful to not wear shoes. Like you, I only wear shoes when I have to, but I have to admit I probably would not run barefoot in the park for fear of stepping on something sticky or icky. And imagine running a marathon in bare feet! The podiatrist in the article likes those slipper thingies that look like feet, with toes in them. They keep those burrs and icky things off but allow the feet to move naturally. That sounds like a great idea to me! First of all, for the record, feet are the ugliest thing on the human body. Second of all, I got to admit that I'm a barefooter. My mother just recently bought me a pair of sandals to wear around the house because she doesn't like the fact that I go around barefoot. She has planter fascitis (sp?) and says that if I start wearing sandals or something around the house, I don't have as great a chance at ending up with it, too. I wear the sandals around the house occasionally, but I can't at the moment because I just got a tattoo on my foot and I can't let anything rub it for a few days. For those of you that are curious, I had a claddagh with a green heart put on top of my foot and it's absolutely awesome. Power to the barefooters! Valerie, a claddagh! I'm green with envy, pun intended. Tell your mom barefootin' it doesn't cause plantar fascitis. Keeping the spine limber, stretching out the back, and strengthening the core muscles will help get rid of it, though. Power to the barefooters!! Yes! I love being barefoot, shoes are off as much as possible and if I absolutely have to wear them out, I pick flip flops. I wish I could be barefoot at work (hospital), but afraid of what I'd bring home with me. i am a lip-flop girl all the way, but now that my mom's had foot surgery because she has no arch and over the years her foot started falling apart, I'm afraid to wear them like I used to. I'm supposed to start wearing Danskos 24/7. They don't make a flat, cheap, foamy flip-flop. Boo hoo! I have two runners in the house (not me!) and they've been talking about barefoot running for a while now. Neither wants to give it a try, though. Son #2 has a friend on his track team who swears by running barefoot--it's always strange to see him run by. Kate, completely off topic here, but just found the author's listing for Printer's Row. I'm already supposed to teach Heather to crochet, LOL. Do you know if you, Heather, Jess Lourey, and Wendy Lyn Watson are all going to be in the same general vicinity at this? Or am I just going to have to hunt through the crowds chanting your names? LOL!! Heather, Wendy and I are on a panel together Saturday afternoon from 1:30-3 p.m. I believe it's called "Mysteries with a Cozy Twist." Look for us! I'd like to meet you. I want to meet you too, but don't know at the moment if I'm going to be there Saturday or Sunday. It depends on if my husband has to work overtime that Saturday. Yes! A barefooters' club! We can have buttons that read: shoes optional. Ha! Love it.